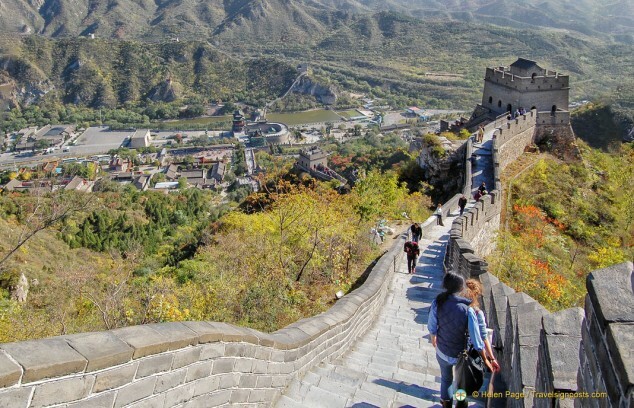 For most visitors to China, the dream of climbing the Great Wall of China is one of the main reasons for coming to this country and each year millions of foreign visitors, as well as locals, do just that. 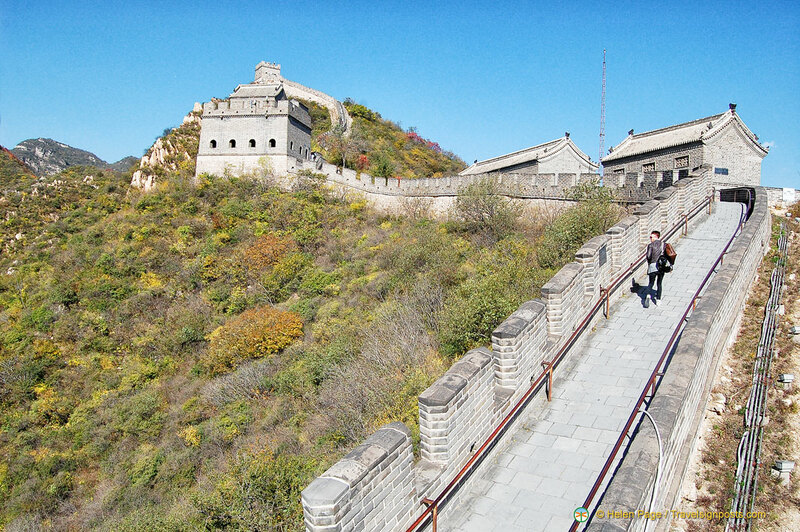 There are many passes to the Great Wall of China and we are approaching from the Yuyongguan or Yuyong Pass which is some 50km from Beijing and the closest to the capital. It’s almost impossible to avoid crowds in China, but we get here at 9 a.m. to at least try to beat the throngs of locals who arrive an hour or so later. Tony and I have climbed the Wall in the distant past and so it’s exciting for us to be back here again to see the changes. But, I must admit to a degree of anxiety when I first set eyes on the steep ascent of this first section of the wall. I don’t recall starting off with such a steep climb in the past. 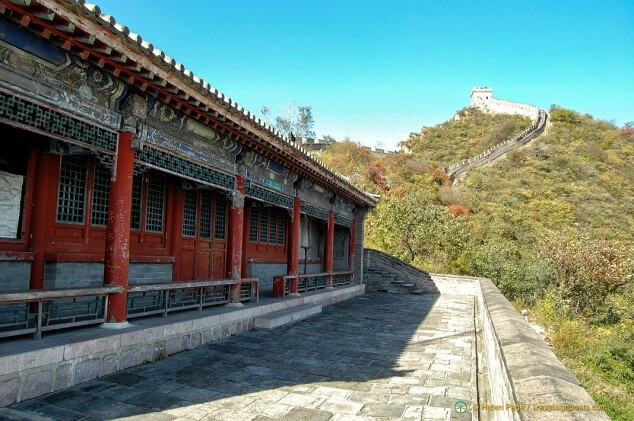 Maybe it’s because my first visit was from Badaling, the first pass to be opened to the public. Tony is fearless of course, but I begin to have doubts as to how far up I want to climb. 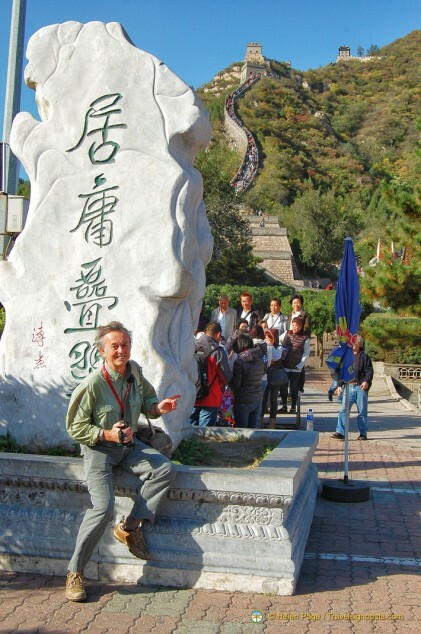 At the base of the Great Wall is this huge marble slab which is popular with locals wanting to pose in front of it. We don’t know what the Chinese characters mean at the time, but take a shot of the marble anyway, just in case it is significant. On checking with my sister-in-law later, she advises that it roughly translates to “Yuyong a place of outstanding natural beauty, lofty peaks and lush mountain vegetation”. Several fortification walls were built by various Chinese dynasties as early as the 7th century BC and archaeological surveys have established that the entire wall and its various branches measured some 21,000 km. 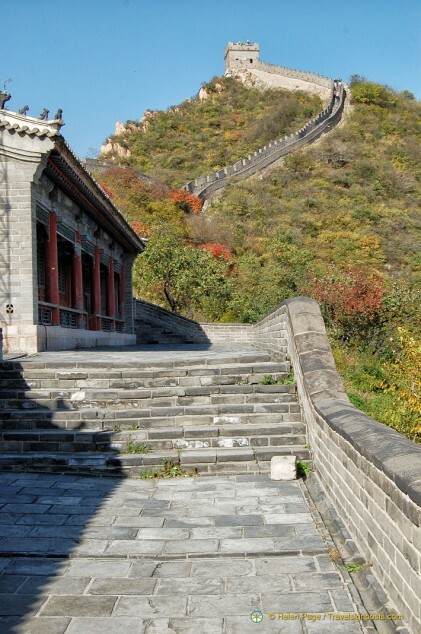 However, what remains of the existing wall today is from the Ming Dynasty, who were the most prolific wall builders. Stretching from the Shanhaiguan Pass on the east coast to the Gobi Desert in the west, the Great Wall is more than 5,000 km long. 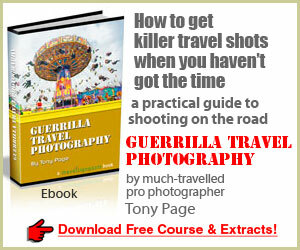 Bright-eyed and bushy-tail, Tony sets off on his climb, armed with his video and a bag full of camera gear. Climbing up this very steep first section and doing his video commentary at the same time is no easy task. The Yuyongguan, located in the Guangou Valley, is one of the three greatest mountain passes of the Great Wall of China. Winding its way along this section of the Great Wall is an 18 km canyon. The views down to the valley and pass from where we start off are spectacular. 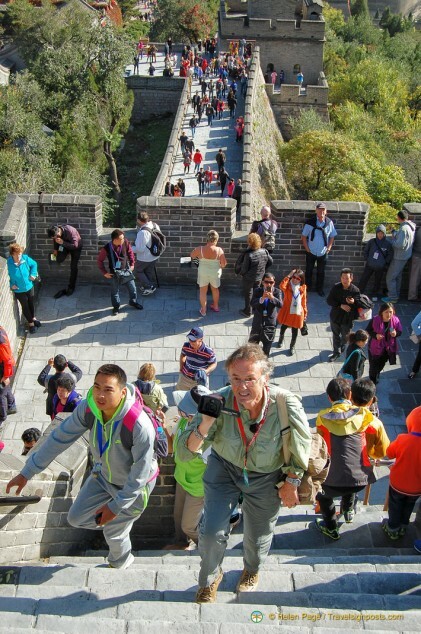 The good thing about climbing to the higher reaches of the Great Wall is that you lose the masses of people who seem to drop off the higher you climb. And when you stop to catch your breath, it’s also time to look around and take in the spectacular views. The patches of gold and burnt orange vegetation hint that fall is on its way, even though the hot weather does not seem to suggest this – it’s mid-October and still very hot. Luckily for us, there is a strong wind blowing, or else we will be cooking in the heat. 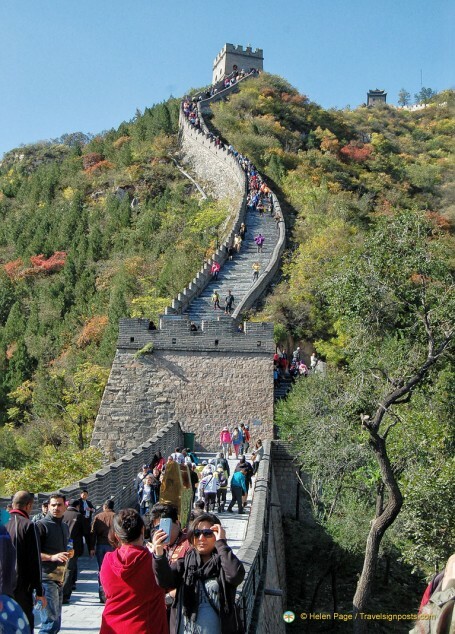 In any case, Autumn is a good time to climb the Great Wall. 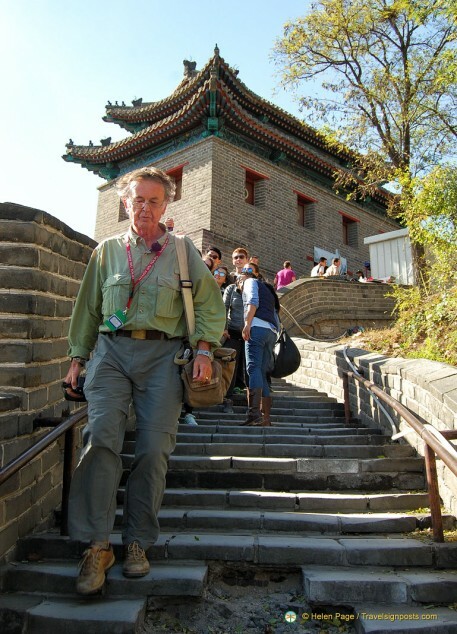 In 1983 when I first climbed the Great Wall, much of it was along crumbled ruins. 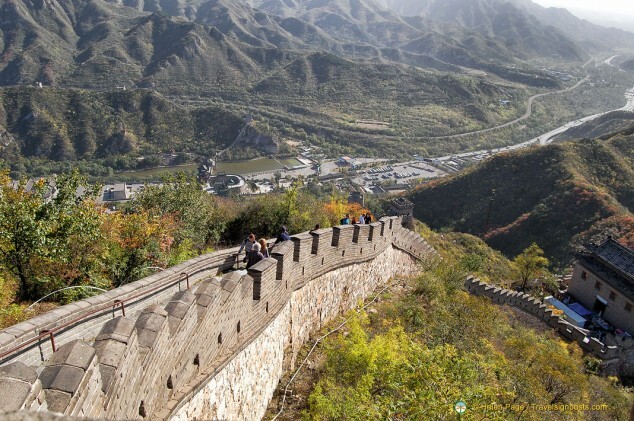 In 1984, Deng Xiaoping told the people to “Love China and Repair Great Wall” and as you can see, the Chinese have done a great job of restoring the Wall. This section of the Wall is paved, there are no steps here! It is steep though and just in case you think that you can use the railing to pull yourself up, you can forget about it. The railings are about knee-high. 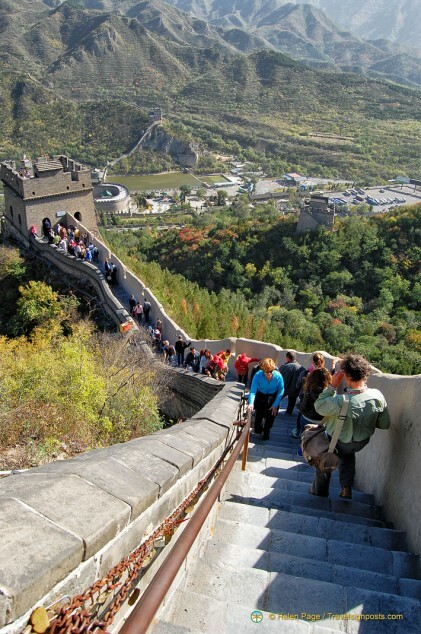 The Great Wall was built to protect the various Chinese states and empires against invasions by the Mongols, Manchus and others. At one stage there were up to 25,000 watchtowers built along the walls. For us, each watchtower we reach is a measure of how far we are managing to climb along the Wall. This colourful building was once the post of one of the military commanders. The building is shut so we don’t get to see the inside. It’s time to leave so Tony makes his way down. You do have to be careful walking down as the steps are of different depths. One missed step and it’s a long roll down. In this section there are some repair works happening, but no signs to warn visitors of the danger. Tony stops to video the people making their pilgrimage up the Great Wall, some with greater ease than others. 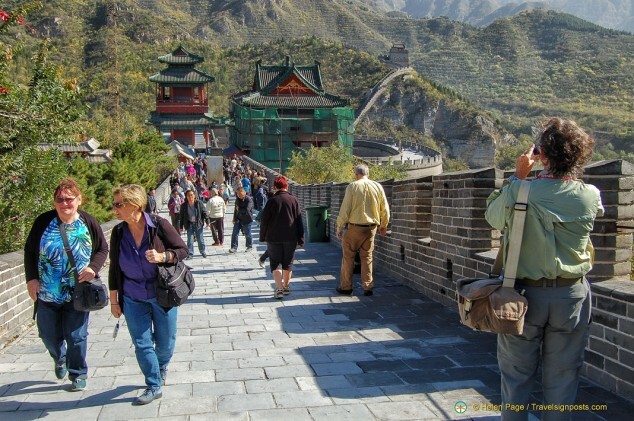 A young, slightly heavy, Italian-American guy gasps for breath with each step he takes, whereas the wiry old Chinese ladies all seem to manage quite well. Walking down may seem easier, but by the time we reach the ground level, our legs feel like jelly. We turn around and looking up at the wall snaking its way up the hill, we feel a sense of achievement at making it to the top watchtower. 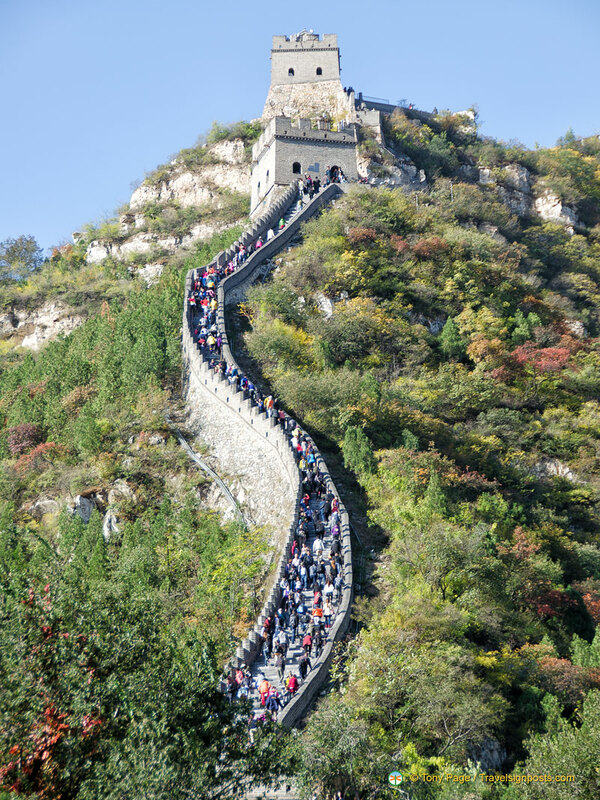 Mao Zedong once proclaimed that “He who has not climbed the Great Wall is not a true man” and we’re proud to say that we’ve climbed the Great Wall twice! At this point we know we’re home and dry and we have a little time left at the base. 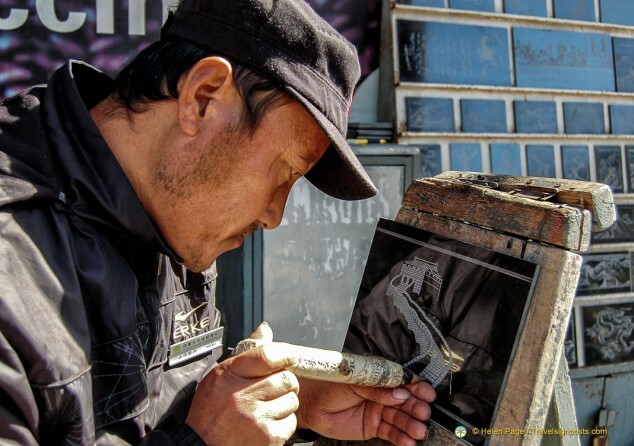 This man does brilliant etchings of the Great Wall onto slabs of slate. 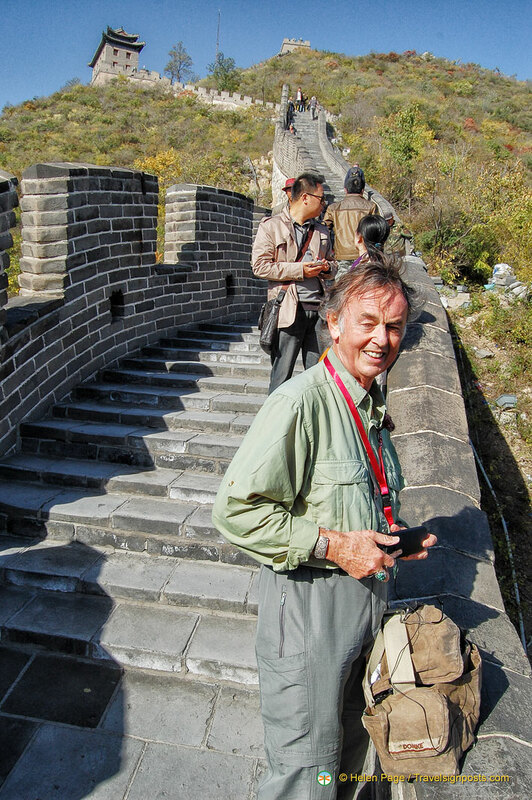 If you’re looking for a souvenir of your Great Wall climb, have a look at his work. The colourful roof is that of the Incense Pavilion. If you have time, it is worth taking a look in here. 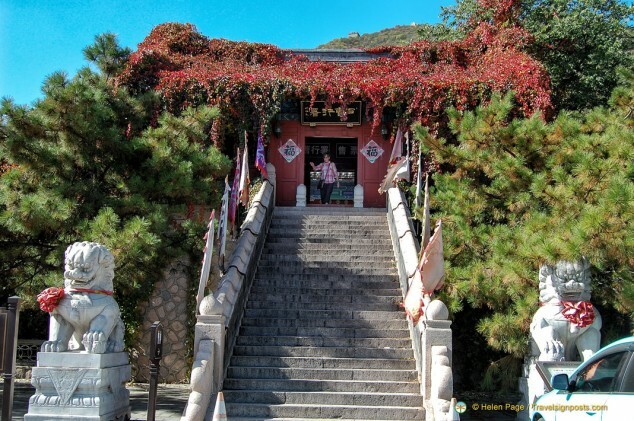 The path to the temple is lined on both sides by stone sculptures of the Chinese zodiac and the courtyards are a peaceful place to relax after an exciting climb up the wall. 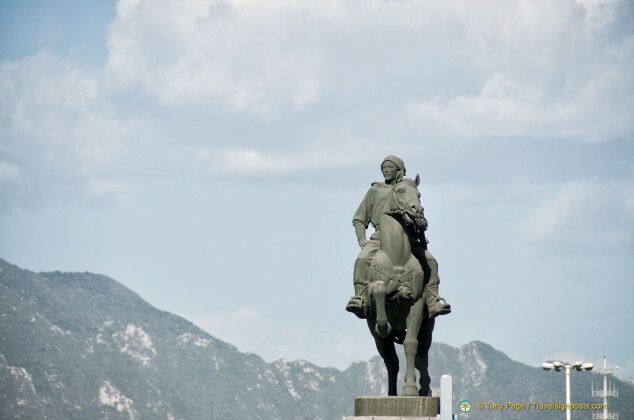 With his long lense, Tony spots the statue of one of the famous General who defended the wall against foreign invasion. I unfortunately missed this view. 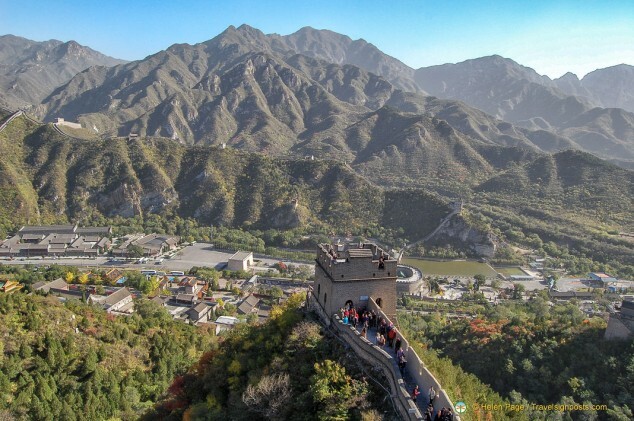 Our trip to the Great Wall was part of an organized tour of China, but if you’re doing your own thing, you can always join a Small Group Trip to the Great Wall.